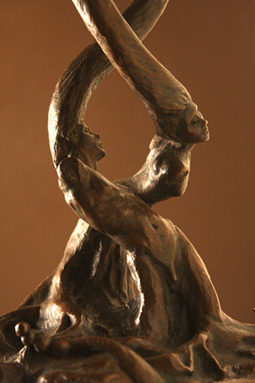 The Series called Second Metamorphosis originated as a part of a planned exhibit for a project in 1993 called LifeXtinction. Second Metamorphosis is to express the spiritual perspective of an exploration of the condition of extinction in relationship to life. The project is intended to unmask unconscious barriers to facing the fragile nature of life and to expand our ability to care deeply about the existence of life. It is designed with the intent to create a better understanding of the diversity of beliefs and ideas around the continued existence (or lack of) consciousness beyond clinical death. 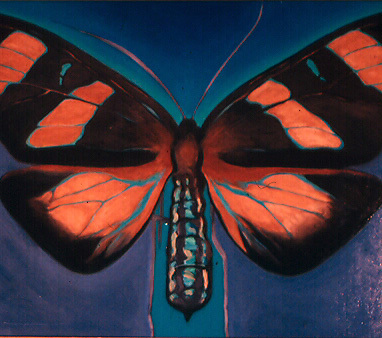 The LifeXtinction Project, or the Second Metamorphosis series has not been completed to date. 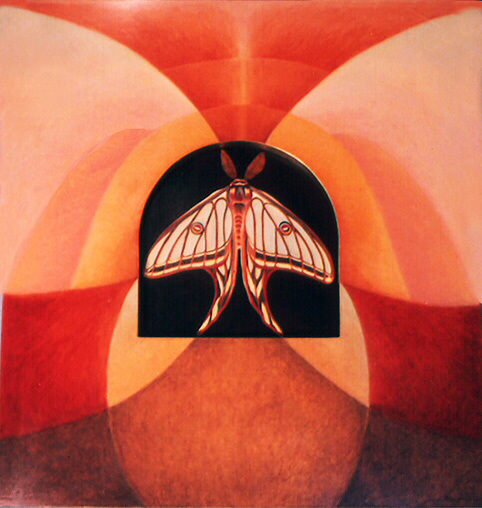 A series of five paintings are to depict five separate moths, representing five major continents. The word moth is Greek for psyche. 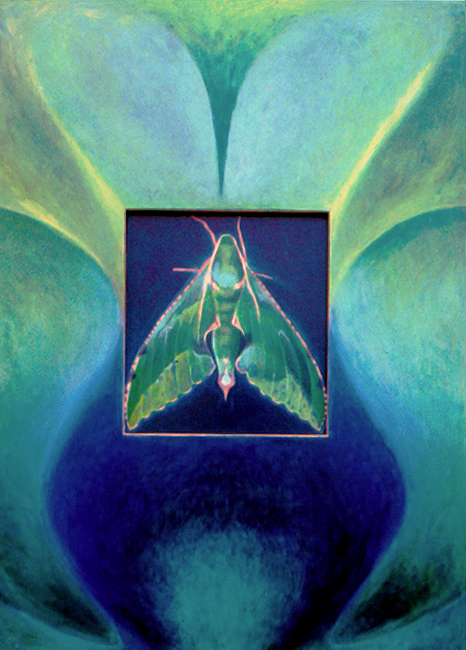 Actias Luna L. – Luna Moth – Southeastern Canada, Eastern U. S.
As a painting challenge, I constructed masonite shadow boxes where the painting would exist on two planes: one central inset depicting a careful rendering of the moth in oil. 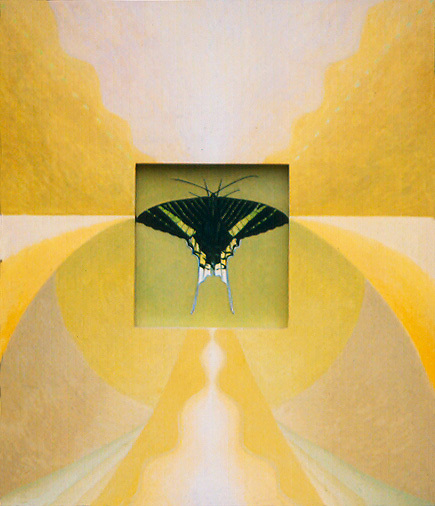 The second plane framing the moth is handled in a different manner, whereas the only defining principle is to utilize the patterns and colors within the moth to explore freely another kind of painting, without any predefinition of form. 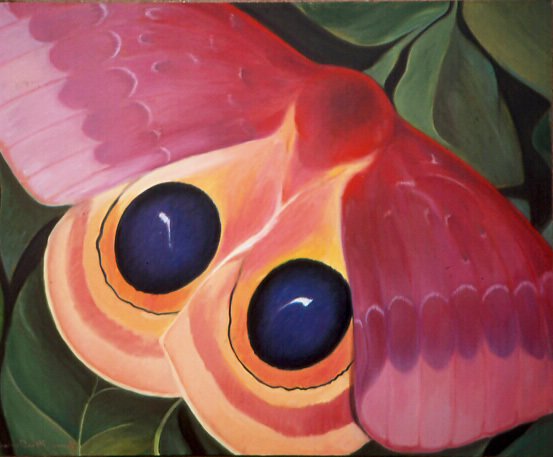 In some cases, the patterns within the moth wings inspire an extension of that design in the outer painting, but I attempt to approach the outer painting as freely as possible of preconceived ideas. The idea of attempting two separate painting styles on two separate plane surfaces was an attempt to represent two dimensions. The moth already as undergone a chemical transformation in the pupa state and has emerged as a winged creature. Yet, the moth, a creature of the night, is drawn to the light. It is actually distracted by artificial light. The moth travels through the night by passing through moonlight “beams”. When it detects an artificial light, be it a streetlight or a candle, it becomes disoriented and is drawn to it, and is often torched in the process. The multi-dimensional lifespan of the moth serves as a symbol for the human mystery of what lies beyond life.